Thermodynamic and kinetic data are important for designing a CO2 absorption process using aqueous amine solutions. A piperazine derivative, 1-(2-aminoethyl)piperazine (AEP), was blended with aqueous amine solutions due to its thermal degradation stability, high CO2 loading (mole of CO2-absorbed per mole of amine) and high solubility in water. In this study, the vapor liquid equilibrium (VLE), absorption rate, and species distribution of aqueous AEP solutions were studied to develop an optimum amine solution in a post-combustion capture process. 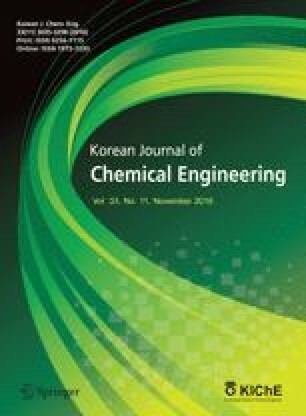 The VLE and apparent absorption rate of the aqueous 30wt% AEP solution were measured using a batch-type reactor at 313.15, 333.15, and 353.15 K. The AEP exhibited approximately twice higher CO2 loading compared with monoethanolamine (MEA) at all temperatures. The apparent AEP absorption rate (k app =0.1 min−1) was similar to that of diethanolamine (DEA) at 333.15 K. Speciation of the CO2-absorbed AEP was analyzed using 13C NMR. Although AEP featured a primary amino group and secondary amino group, it did not form bicarbamate upon reaction with CO2 based on analysis results. AEP-1-carbamate was primarily formed by reactions between AEP and CO2 during the initial reaction. Bicarbonate species formed as the quantity of absorbed CO2 increased. This article is dedicated to Prof. Sung Hyun Kim on the occasion of his retirement from Korea University.